On a recent day at the Porter County Fair in Valparaiso, Indiana, I walked with the kids through the long corridor of fair food. 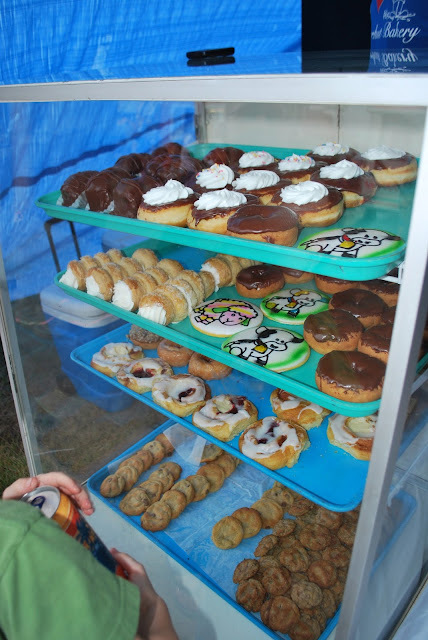 They spotted these doughnuts in a tent for Fingerhut Bakery and begged for some. The bakery has locations in North Judson and Knox. We tried one of those doughnuts on top with whipped cream and then also a danish. Compared to the prices of the other fair food, it was a bargain. $1.25 for a doughnut and to go with it a big 24 ounce can of sweet tea for $1. Unfortunately, we are a long way away from their bakery locations, but if I ever find myself in that area, I'll be sure to pick up some of their yummy doughnuts.